Measure your banking service against some of the industries biggest players with our challenger bank benchmarking service. 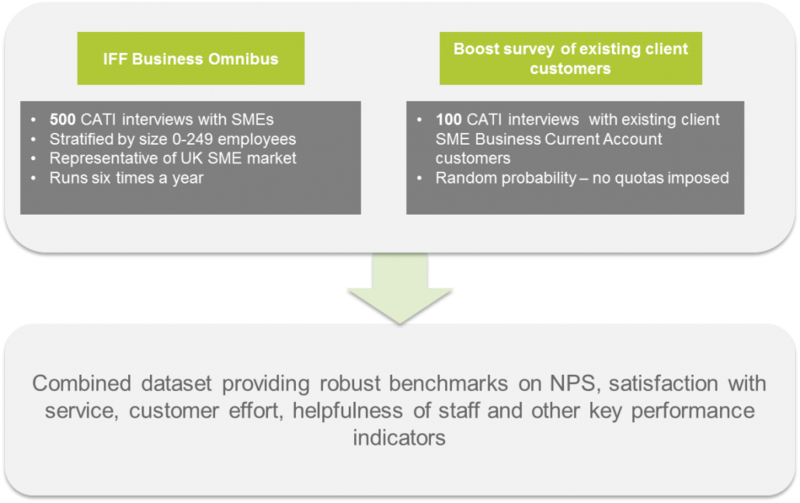 At IFF we realise that customer satisfaction tracking can often be of limited value without a realistic bench-marking component, but that due to having relatively small customer bases, Britain’s challenger business banks often do not obtain robust numbers of customer interviews on traditional trackers. To meet this challenge, IFF is launching its Challenger Bank Relationship Tracker, a syndicated survey using a blend of representative IFF business omnibus and client-supplied customer sample. This new product benchmarks challenger brands and new market entrants against Barclays, HSBC, Lloyds Bank and RBS. Quality: Every one of your customers is important. To ensure they are treated with the upmost respect and sensitivity we conduct interviews through a team of highly trained and professional B2B telephone interviewers. Value: A cost effective solution to provide robust ongoing benchmarks amongst business owners. Insight: Additional background and trend data, analysis and ‘firmographic’ information, as well as a full PowerPoint report and presentation are provided for each subscribing client.